Globalization and Sport is a unique collection which places sport at the heart of debates on global processes. Richard Giulianotti is Professor of Sociology at Durham University. Roland Robertson is Professor of Sociology and Global Society at the University of Aberdeen. 1. 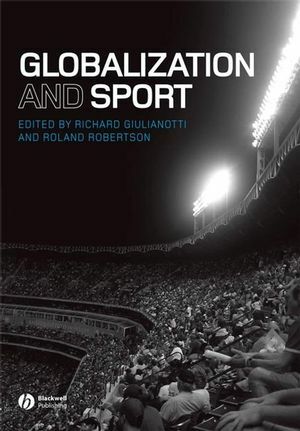 Sport and Globalization: Transnational Dimensions: Richard Giulianotti and Roland Robertson. 2. Not Playing Around: Global Capitalism, Modern Sport and Consumer Culture: Barry Smart. 3. The Grobal in the Sporting Glocal: David L. Andrews and George Ritzer. 4. Steps to an Ecology of Transnational Sports: Thomas Hylland Eriksen. 5. Recovering the Social: Globalization, Football and Transnationalism: Richard Giulianotti and Roland Robertson. 6. Is Baseball a Global Sport? America’s ‘National Pastime’ as Global Field and International Sport: William W. Kelly. 7. More Than a Game: Globalization and the Post-Westernization of World Cricket: Chris Rumford. 8. Imagined Communities in the Global Game: Soccer and the Development of Dutch National Identity: Frank J. Lechner.